With techniques of Deeper Perception, we can stop the action when watching a DVD or recorded TV show. We can stop to read anyone’s aura, do face reading, even do Skilled Empath Merge. Or we can just marvel at the Enlightenment coaching built into a film or TV show. What happens, right on the surface? What do you purposely download to help you grow? AMANDA has given us a great tip about using the “Anger Management” movie for therapeutic or evolutionary purposes. I love watching the reality TV show “Chopped” these days, learning how people handle competition. What fascinating stories they tell themselves — subjective mythology, as all folks use. Then I observe how that mythology affects performance in objective reality. Especially I get a giggle over themes around spiritual development. In the prepared bio, a contestant might present himself as a lover of martial arts or an avid Buddhist meditator or a faithful Christian. Such a contestant seldom lets one description suffice. Instead, there will be repeated references to the belief system — in success or in failure. I have taken to counting them. 😉 Usually the highest number of such references goes with being eliminated (“Chopped”) early in the competition. For instance, I remember one adorable chef, a very committed Buddhist. As I remember it, Gladys talked repeatedly about the importance of staying peaceful and centered at all times. She moved slowly, as if in a dance. Or perhaps a trance. During the Appetizer Preparation Round, she finished some two minutes early and stood, serenely contemplating her dish. Oboy, was she chopped fast. I don’t remember offhand whether she spaced out on including all of the four required ingredients or perhaps her food was excessively bland. I do remember her sweet way of walking out, commenting for the camera on her defeat. No taking responsibility for the mistakes that caused her to be eliminated. Nope, it was the “Everything happens for a reason” path. So sweet, yet such a way to stay stuck, strip the growth portions away from life experiences and make daily life about ideology only. Paying attention, keeping a sense of proportion, life becomes so informative. Even TV and movies can become so wonderfully informative. On “Chopped,” it’s also fascinating to watch how contestants converse between official rounds, whether collaboratively or vindictively or what. Then you get to watch 3 out of 4 contestants lose… How do they lose?” How do other contestants observe them losing? After each of the three rounds on an episode, you see how the winner puts the victory in context of the ongoing story. Is there gratitude or something else? If gratitude, towards what? Any of you Blog-Buddies have favorite learnings from movies, TV, music? Do tell! Ready for a fascinating exercise in Deeper Perception, Blog-Buddies? Very suitable for aura reading research! so check out your favorite chakra databanks and report back to us here. This was fascinating Rose! How people tell themselves stories subjectively, and what an impact that has on their performance in objective reality. Words of wisdom. And what a difference in my life, living as someone who takes responsibility for what I create in my life, rather than being an “everything happens for a reason” person. By taking responsibility, it empowers me to create more of what I want, and less of what I don’t want. Gift of Soul: Very clear, frank, doesn’t hold back. How it’s doing at the time of this photograph: Very powerful and forceful. Gift of Soul: God is always there, like warm, glowing Christmas lights. How it’s doing at the time of this photograph: He kinda takes his open and clear connection to God for granted. Gift of Soul: He has an enormous flow of creativity in everything he does. How it’s doing at the time of this photograph: Full of joy and excitement. Gift of Soul: Full of joy and excitement for being who he is. Full of creative expression. How it’s doing at the time of this photograph: He is having a lot of fun! MELANIE, just to be clear (you modest Sweetiepie), the man whose aura you read was….? VALERIE, to me this is the big meaning of 12-21-12 and beyond. I loved Tanya Byron’s programme on parenting. Here is a picture of her http://news.bbc.co.uk/1/hi/education/7956017.stm I learned a lot watching her help families see where they were stuck. I found the series very moving and thoughtful. It’s sadly no longer aired and I read that the reason she stopped it was because she was concerned it could harm the children involved. That increased my respect for her. Do you think there is a middle way? Just the other day I went for a job interview and was unsuccessful. A friend of mine wrote to me afterwards: “The train that does not stop at your station is not your train.” It comforted me. At the same time, I reflected on my performance during the interview and can see many ways in which I could have tweaked my responses to be more suited for the job in question. So yes, I didn’t get the job because I didn’t perform up to scratch on the day – and I do believe that if I had given more thoughtfully considered responses then I might well have got the job. In other words, it is certainly not all a question of “fate.” I agree about that. At the same time, I know that it is not like me to give such a sloppy performance, and while I can tell myself that I have been extremely tired and had little time to prepare etc etc, I guess there is a part of me that wonders whether my own lack of preparedness was indeed partly because this was not the right opening for me? I mean, I do of course believe in taking responsibility for what happens to us, and at the same time… not all paths are right for us, surely?? Rose, well I’m honoured to have inspired a blog post :). And how lovely was it to see that mischievous grin heading up the Deeper Perception Made Practical page! That film meant a lot to me. It was the beginning of my journey from being an uptight and anxious English person to finding creative expression, flow, intense dance and emotion. 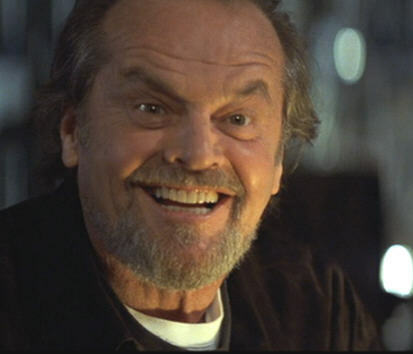 I was so identified with the Adam Sandler character and I found Jack Nicholson terrifying. Now I love him! I learn a lot from TV shows as well, but haven’t come across that insight of yours.. what an observation! Limiting yourself with identity – a powerful lesson. Gift of Soul: Charisma Galore! Can charm anyone, people love being in his presence- communicates a “Devil may Care” relaxed energy that permeates and brings calm to those around him. Gift of Soul: Huge gift for communicating with humor and grace. Sorry – I did not realize there was more than one. I read the aura of Jack Nicholson in the photograph at the top of the page, which is the same as the photograph in the first link of comment #1 of this post. AMANDA, you an an uptight and anxious person? Guess that, like me, you have had some virtual reincarnation in this lifetime. MELANIE, re your Comment 9: It’s just good form when you do an aura reading or Skilled Empath Merge or face reading to include the person you have read. It’s also good practice to include the photo source, if you were reading someone from a photograph. RACHEL, re your Comment 8, of course I think there is a middle way. In fact, see what comes up in the search box for this blog if you type in, “Middle Path.” Which is nearly the same language… and concept. I think it is brilliant, learning what you could from the interview and letting go of the rest. The one thing I would add is that, like anyone in the room or on the phone with another human, a great deal goes on subconsciously. You read that interviewer’s auric modeling, and vice versa. That can have a lot to do with behavior that might seem like “Self-sabotage” but is really smart. As in, “Don’t let me get a job working for that dishonest, sleazy interviewer. Find a way to not seem qualified. There’s some high-flying ideas in here; I see a kite just taking off into the sky. There’ s no limit as to how much Jack can open up, when he will open up, and for how long. In truth, there are no limits to Jack Nicholson’s sense of self and creativity. It’s something that after all these years comes naturally, like turning on a hot button switch. It’s who he is in his professional life. Exploring, tantalizing the audience, always, always giving it everything he can to top whatever it is that the performance requires. Jack sets his own bar, and it’s pretty high. But all in all he’s a good jumper and sees himself jumping the bar every time. Haha! I love it. Subconsciously finding a way not to seem qualified! That’s much better than the “it’s not meant to be” school of comfort…. (The day after the interview, one of my colleagues whispered to me that the man who could have ended up being my boss is rumoured to be a complete b**tard… – pardon my French). Continuing with the aura reading of Jack Nicholson! There s a murky depth in here that he has to push through each time he creates a new character. Theres a thin connection, a thin golden strand as he plays with all this knowledge around him, working it, letting divine drop hints as to his performance, how it feels, how its so glorious to him. He taps into it when he likes and hes not letting any of the murky quality get in his way, though hes not really fully aware of exactly what the murkiness is. His sole purpose is to be an actor, act out emotions sometimes to the biggest extreme, so people can see the extremes, understand its all a joke sometimes, the extremes he will go to, to get a reaction. He struggled with performing in the early years, before he realized this was not to be taken seriously. Jack taps into it, plays it to its full potential, his full potential, then drops it in your lap so you need to figure out the rest. Its all play time for him. Play it up, drop it there for everyone to see and assimilate, then stroll away. Hes done his job. Confidence was won a long time ago. Now its all natural. Hes a performer on the stage of life. He has no bones about setting it all out there. Jack feels confident the audience will see it and figure it out for what it is. Its not his job to spell it out for you, its your job to watch, listen, and learn. He knows he does his job well, and he should, hes practiced it for a long time, long before he was at earth school. His purpose is to show you there is more to any of this living than getting up every day and going to bed at night. His performance is his life event. Hes confident hes got it down pat, and when all is said and done at the end of the day, hes done his job, you now have to do yours. Elaine I enjoyed your aura reading. I got a murkiness at his third eye Chakra Connection to God also. I got that it was drug use mucking it up. Thanks Paige. I didn’t get the cause of the murkiness, just the result. ELAINE, thanks for that clarification in Comment 25. If I might leap in sporting my Teacher Hat, when you do aura reading research or a Skilled Empath Merge, the point is exactly what you noted in Comment 24, ELAINE. You notice what is there, not the cause. Finding the cause of something is not literacy. In the context of aura reading, that would be more the direction of psychic reading, you know? On the other hand, it is possible, PAIGE, that you noticed a quality of drug-taking in Jack Nicholson’s aura at the time of the photo. It is really important, if we are to be having Aura Reading Jamborees, that all you Blog-Buddies appreciate that there is zero need to compare your information to that of others. If you should happen to read the same chakra databank as someone else, it is (as Terry Cole-Whittaker might put it) none of your business if someone else reads that same chakra databank. 12-21-12 and beyond, what happens now?